The Children Hospital Quetta Balochistan. 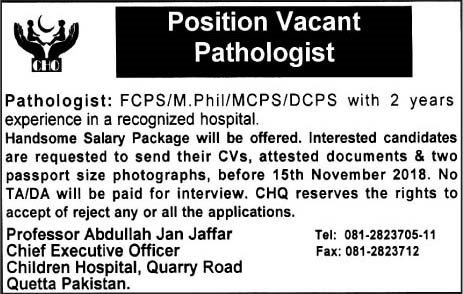 Qualification & Experience: FCPS/M.Phil/MCPS/DCPS with 2 years experience in a recognized hospital. Handsome Salary Package will be offered. Interested candidates are requested to send their CVs, attested documents & two passport size photographs, before 15th November 2018. CHQ reserves the rights to accept or reject any or all the applications.